Kurdish peshmerga fighters ride in a vehicle in the southwest of Kirkuk, Iraq, Oct. 13, 2017. Kurdish peshmerga fighters were refusing Saturday to obey Iraqi soldiers' order to withdraw from the oil-producing city of Kirkuk, leaving the two sides in a standoff as the deadline for leaving passed. A Kurdish security official told reporters that Iraq had told the Kurds to vacate the area after midnight Saturday, local time. But he said the peshmerga would stay put and defend their position. Reporters in the area said there had been no clashes, but fighters on both sides were poised for conflict. On Friday, U.S. Defense Secretary Jim Mattis urged Kurdish and Iraqi forces gathered on the outskirts of the disputed city to "tone everything down" as Kurdish officials continued to warn of an imminent Iraqi invasion. Mattis said the increasingly tense showdown had Washington's full attention. He warned the two U.S. allies that now was not the time to take their focus off the larger fight against the Islamic State terror group. "We can't turn on each other," Mattis told reporters while flying back to Washington following a visit to U.S. Southern Command in Miami. "We don't want this to go to a shooting situation." He added that "my forces are integrated among these forces and they're working to make certain we keep any potential for conflict off the table." A Kurdish peshmerga fighter is seen in the southwest of Kirkuk, Iraq, Oct. 13, 2017. But Kurdish officials insisted late Friday that Iraqi forces, along with Popular Mobilization Units (PMUs), a large fighting force primarily made up of former Shiite militia groups, some of which are loyal to Iran, were massing to the south and west of the strategic city. "This movement is unusual and very provocative," Kurdistan Regional Government Representative Bayan Sami Abdul Rahman said during a briefing in Washington. "There is no need for this deployment. There is no ISIS there," she said, using an acronym for Islamic State. "There is nobody to fight unless they want to provoke a fight." Rahman said Kurdish forces and intelligence units had observed a substantial buildup of Iraqi forces and of the PMU over the previous 48 hours, including tanks, heavy artillery, Humvees and mortars, all pointed at Kurdish peshmerga units. "It's very clear that this an attempt to bully, to threaten and to try to force Kurdistan into submission," Rahman said, adding Iran was also pushing for Kurdish forces to retreat. "Qassem Soleimani and others have been in Kurdistan," she said, referring to the head of Iran's Revolutionary Guard Corps' Quds Force. "They have been putting pressure on us, giving ultimatums." 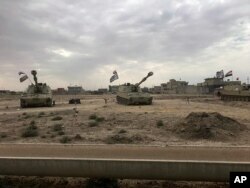 Iraqi tanks deploy in the village of Bashir, south of Kirkuk, Iraq, Oct. 13, 2017. Despite the Kurdish claims, Iraqi leaders said they had no plan to attack the city and were simply asserting authority they already had over the region. "There will be no war on our citizens anywhere," Iraqi Prime Minister Haidar al-Abadi tweeted Friday. "There won't be a battle," Iraqi Special Forces Major Assad al-Assady said while on a mission to fight IS in West Anbar province on Friday. "This is a political problem, and it will be solved with dialogue." In a move aimed at reducing the risk of clashes, Iraqi Kurdish officials said they had shifted their defense lines south of Kirkuk. But officials said they also had sent in reinforcements — another 6,000 troops since Thursday — adding to the tens of thousands of peshmerga forces already in the area. 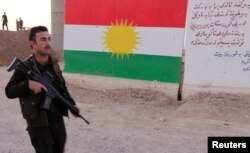 "Some civilians are out on the streets with their guns," said Dara Saieed, a local journalist in Kirkuk. "People are nervous." And peshmerga officials said that while they preferred not to fight, they would defend themselves and Kirkuk if Iraqi forces or the PMUs tried to move in. "If they come in without permission, it is sign of war, nothing else," peshmerga Colonel Hemn Hassan Salih said Friday in a phone interview from his base in Kirkuk. Barriers with defaced Kurdish flags are seen outside an evacuated checkpoint in the village of Bashir, south of Kirkuk, Iraq, Oct. 13, 2017. Iraqi and Kurdish peshmerga forces have been fighting as allies against Islamic State militants, and the U.S.-led coalition has said it fears disputes between Baghdad and Irbil could distract from the fight. But some soldiers say the standoff could simply be posturing ahead of negotiations for a diplomatic solution. Negotiations would be the best solution for all sides, agreed peshmerga Captain Taher Aziz, while manning a Kurdistan Region border in Khazir province. But without international involvement, he said, conflict may be inevitable, no matter what Iraq's central leadership in Baghdad says. "The PMU leadership may give orders that are not the same as the ones coming from the central leadership," Aziz said. As a semiautonomous region, Iraq's Kurdish region has maintained its own borders for more than 25 years, with Iraqi forces entering only with permission of Kurdish authorities. In late September, Kurdish voters passed an independence measure in a referendum by more than 92 percent over the objections of Baghdad and the international community. Since then, the region has become increasingly isolated, with international flights grounded and other sanctions imposed. An Iraqi army technical team released a statement on Friday saying, "Our forces have the right to enter any province in Iraq," but thus far it has not crossed into Kurdish-controlled territory. National Security Correspondent Jeff Seldin and VOA's Heather Murdock contributed to this report.